Every year the Recreational Fishing Licence (RFL) Trust Account allocates the fees you pay for your fishing licence to projects that will directly improve recreational fishing in Victoria. Through the 2010/11 round of the Recreational Fishing Grants Program (RFGP) - Large Grants Program, over $1 million will be allocated to 10 projects to improve recreational fishing in Victoria. 17,000 'Know your limits' pocket cards in four different languages. The first of two fishing platforms at Devilbend is complete and the reservoir is now open to fishing. A report is tabled in Parliament in October each year concerning all RFL Trust Account revenue and expenditure. The Recreational Fishing Grant Program Projects 2010-11 report is available for revenue spent in 2010/11 and for previous years. The following is a summary of RFGP projects that will be funded from 2010/11 RFL revenue. Unless otherwise stated, these projects are listed under the Department of Economic Development, Jobs, Transport and Resources (the department) former Department of Enivronment and Primary Industries (DEPI) region from which the project application emanated. $133,920 to develop a reliable supply of catfish fingerlings and to establish new stocking based recreational fisheries in selected northern Victorian waters. $181,386 to better understand snapper movement and habitat use in Port Phillip Bay using acoustic tracking. 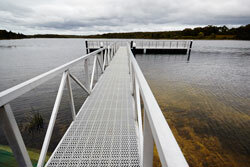 $200,000 to construct two designated fishing platforms at Devilbend Reservoir, Mornington Peninsula. $221,386 to better understand snapper movement and habitat use in Port Phillip Bay using acoustic tracking. $60,800 to improve angler access to the Werribee River. 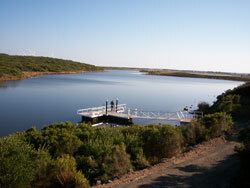 A new fishing platform at Yambuk Lake. $32,408 to construct a designated fishing platform at Yambuk Lake. $8,800 to conduct a risk assessment of Lake Colac to determine if selected species can be stocked. $186,000 to determine the spawning sources, movement patterns and nursery area replenishment of King George whiting. $130,910 to conduct research into the future sustainability of the recreational fishery for shortfin makos in Victoria. A fishing line disposal bin at Hopkins River, Warrnambool. $65,000 to re-establish Victoria's recreational fishery for Chinook salmon. $34,000 to install a further 40 'Seal the loop' recreational fishing line disposal bins around Victoria. For more information about applying for grants, please visit Recreational Fishing Grants Program.